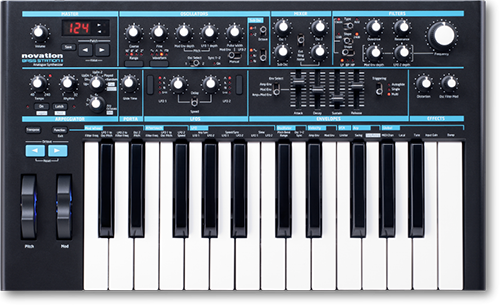 The Novation Bass Station 2 synthesizer 25 key keyboard features two analogue, sync-able and tuneable oscillators with four selectable waveforms, a third sub-oscillator, noise and ring modulation. The multi-mode classic filter can be set to low, hi and band pass with 12 and 24dB slopes for great bass and acid leads. Effects include analogue distortion, filter-modulation effects and a separate filter overdrive. It includes 64 patch memory slots, a step sequencer and arpeggiator. Modulation sources include triangle, sawtooth and square LFO waveforms, as well as sample and hold, and two ADSR envelopes for filter, pitch and pulse width modulation. Watch a demo here.